Fort Smith, Arkansas - One of the most recognized Arkansas Web design and Arkansas Web development companies on the Internet. Professional Web design at it's finest. Designing Websites that get noticed. View our award winning Web sites on the following pages. If you are looking for a well designed Website with a professional look you have arrived at the right Web site. Quality design is used in every Web site that we design. We are one of most recognized and respected Arkansas Web design and Arkansas Web site development companies on the Internet today. Why are we one of the most respected Arkansas based Web site design hosting companies on the Internet? We custom design our web sites to our client's satisfaction, we finish our website designs in a timely manner, our clients are our most valued asset. We offer superior Arkansas Internet Web site design hosting for a low monthly fee. As an Arkansas Website design and web hosting company we service all businesses in the Arkansas area. Our best advertising has always been by word of mouth. Most of our clients have been with our company for many years. Be sure to visit our Arkansas web site design portfolio of Arkansas businesses. Our clients have come to trust and rely on our services. We feel we have the finest Arkansas web designers, they are all formally trained in web graphics, computer graphic art and design. For some reason Arkansas web designers win many awards for their site designs, our Arkansas web designers included.. Sometimes we feel this is because we live in one of the most beautiful states in the nation. Arkansas inspires many artists young and old, from fine art, artists to web graphic designers. Web design in Arkansas is worth stopping to look at. We hope you will enjoy viewing our site designs and will contact us about helping you put your business online. Our company is known for its reliability and quick service. If your business in not located in Arkansas we can still help you by designing a custom website for you. We have designed many websites for businesses accross the country. We have the finest Fort Smith web site designers & graphic design artists. They are all formally trained in website design and graphic design. Offering you among the best Fort Smith website designers & graphic design artists. If you have internet access in Fort Smith or anywhere in Arkansas you have an opportunity to place your business online and watch your web site improve your sales. Arkansas Internet access also allows others to view your website observing what your business has to offer. Internet website design is your opportunity to inform your clients about your services. An Internet web site design is an asset to any business. A website is your online brochure. It is the best advertising value for your money. Arkansas internet solutions - We are a leading Arkansas internet solutions provider. Our internet solutions include, web site design, web hosting, web services, and ecommerce. Our year of experience in the Arkansas internet solutions business has made us a leader. We also specialize in helping businesses understand how their Arkansas internet solutions will help their business. Visit our site and see why we are a leading Arkansas web site design company. We have been helping many Arkansas businesses grow their business online. As an Arkansas web site design company we can put you business online creating your company image online. Our year of experience has made us one of the most recognized Arkansas web site design companies. Visit our web site online and view our Arkansas web site design company to see what we have to offer you. Arkansas design graphic web - Our Arkansas design graphic web designers are all formally trained in computer graphic arts and internet web site design. This is helps your company have a well designed and fast loading website. You may ask why choose an Arkansas design graphic web artist. The answer is simple design graphic web artists are professionally trained to design top quality business graphics for your site. Design graphic web designers and artists will select the right colors and designs to promote your products and business. We provide the highest industry Arkansas web services. Our Arkansas web services include, a well designed website, web hosting services, and a consultation to help you get your website off to a great start. We feel we offer the best Arkansas web services available. Click on our web hosting button and view our Arkansas web services hosting. Looking for a regional web site design company or firm. If you live in the state of Arkansas you have just found one of the Arkansas Web Site Design - Regional websites. Here you will find an Arkansas Web Site Design - Regional Websites Portfolio. View our regional portfolio of Arkansas Web Site Designs. 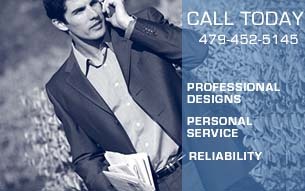 See why we are one of the leading Arkansas Web Site Design - Regional design companies and firms. Do you need Arkansas website updating services on a regular basis. Contact us today and compare our low Arkansas website updating services. We give large discounts to companies that need website updating on a regular basis. If you have an ecommerce website or an information website and need web updating service contact us today and start having your site up todate at a low price. Now updating your Fort Smith, Arkansas website just got easier and cheaper. Call us today or contact us online about our Arkansas website updating services. All graphics, art work, animation and all other information and materials on this web site are copyright protected. They are not to be reproduced in any form in whole or in part without the written permission of the Virtual Art Productions.